FACT CHECK: Did Sen. Elizabeth Warren Describe Her Race as 'American Indian' on Her 1986 Texas Bar Card? U.S. 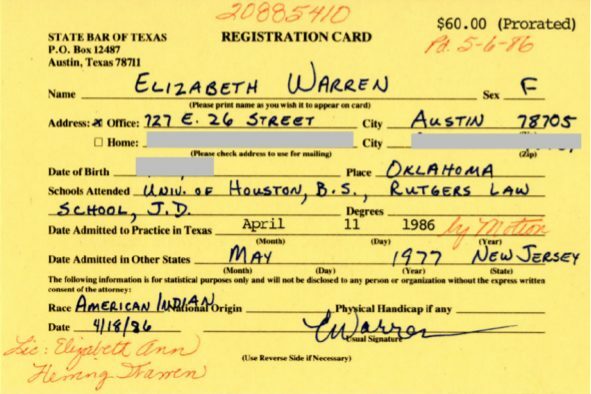 Senator Elizabeth Warren listed her race as "American Indian" on her 1986 Texas State Bar registration card. In 2019, Senator Elizabeth Warren of Massachussetts began to resile from previous statements she had made about her Native American ancestry, a source of criticism that had been used against her since she first ran for the U.S. Senate in 2012. In reality, Warren has very little Native American ancestry (albeit more than the average American of European origins), but her public pronouncements, including professing herself to be “very proud” of her heritage, have attracted criticism and even ridicule since 2012. President Donald Trump routinely refers to the Democratic senator with the mocking epithet “Pocahontas” and on one occasion offered to pay $1 million to a charity of Warren’s choice if she could demonstrate Native American ancestry. Warren did just that in October 2018, when she published the results of a DNA test which concluded that the “vast majority” of her ancestry was European but that her lineage was very likely to include one Native American ancestor somewhere between six and 10 generations ago. On 31 December 2018, Warren announced she was launching an exploratory committee for a 2020 presidential campaign and was widely expected to formally declare her candidacy for that office in early 2019. Against that background, the high-profile Democrat began in February 2019 to step back from her earlier public statements about her Native American ancestry. Sen. Elizabeth Warren said that she was sorry that she identified herself as a Native American for almost two decades, reflecting her ongoing struggle to quiet a controversy that continues to haunt her as she prepares to formally announce a presidential bid. Warren has been trying for the past year to get past the lingering controversy over her past assertion that she is Native American. In addition to the DNA test, she released employment documents over the summer to show she didn’t use ethnicity to further her career. And in a speech a year ago she addressed her decision to call herself a Native American, though she didn’t offer the apology that some wanted at the time. 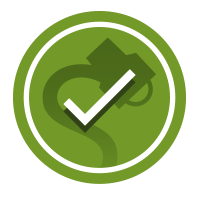 But as Warren undergoes increased scrutiny as a presidential candidate, additional documents could surface to keep the issue alive. Using an open records request during a general inquiry, for example, The Post obtained Warren’s registration card for the State Bar of Texas, providing a previously undisclosed example of Warren identifying as an “American Indian.” Warren filled out the card by hand in neat blue ink and signed it. Dated April 1986, it is the first document to surface showing Warren making the claim in her own handwriting. Her office didn’t dispute its authenticity. The revelation that Warren had personally described herself as “American Indian,” in her own handwriting, formed the basis of widespread news reports on 5 and 6 February 2019 and prompted enquiries from Snopes readers about the authenticity of the document described by the Washington Post. The card showed that in blue ink, Warren entered her race as “American Indian,” listing her office address as 727 E. 26th Street in Austin — the address of the University of Texas law school, where she was a professor at the time. The card was signed by Warren and was dated 18 April 1986. The Boston Globe. 10 October 2018. CBS News. 3 May 2012. Fox News. 6 February 2019. USA Today. 6 February 2019.